Andrea’s publishing career began in 1994 when her first novel was released by Heartsong Presents book club (Barbour Publishing). In 2007, Andrea earned her certification in Christian life coaching and she’ll soon earn her bachelor’s degree in Business Management. Meanwhile, Andrea continues to write. 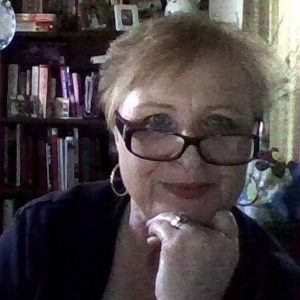 Her latest releases include: Give Me Thine Heart and Love’s Guiding Light (Steeple View Publishing). In 2019, the long-awaited third installment in her Shenandoah Valley Saga will release. My latest release is Love’s Guiding Light. 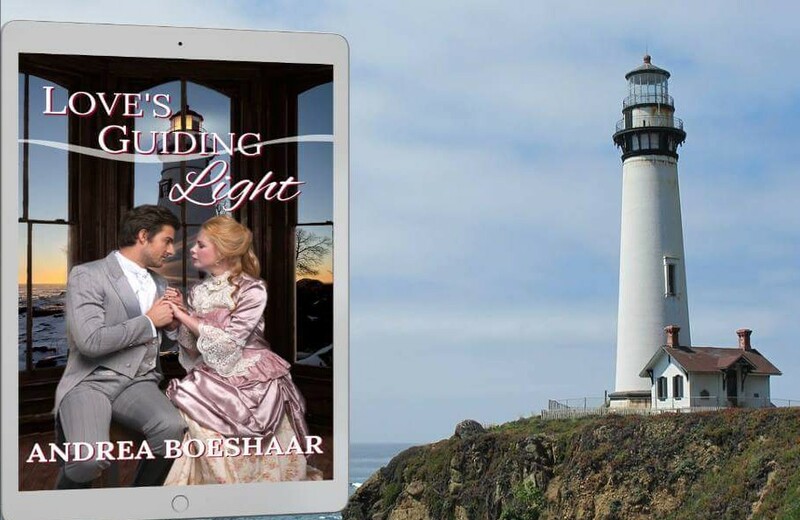 It is a historical romance about a young woman fearing the loss of her home at the North Point Light and the men in her life who attempt to help her—but only one is successful. 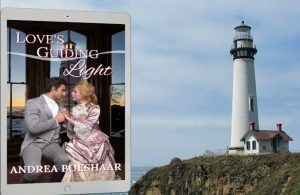 The story is set here in Milwaukee, Wisconsin, and is centered around the North Point Lighthouse. I grew up not far from the lighthouse which fell into disrepair by the time I set out to research it back in 1999. At the time the Coast Guard owned it and I wasn’t allowed inside the cottage or tower for fear it might be unsafe. Now, however, it’s owned by a private entity who has fixed and refurbished the North Point Light and visitors are welcome. My work is more-or-less Christian historical romance. Some books contain more romance than others and some are even lighter on Christianity than others—mostly because of publishers’ requirements. Now that I’m a hybrid author, however, and one who is concentrating on the Indie side of hybrid, I can enjoy writing the stories God puts on my heart. I’m not beholden to a publisher’s guidelines, and it’s quite freeing. It almost feels like the way Christian romance / fiction used to be in the 1990s. I write because I can’t NOT write. Oh, I take breaks, but sooner or later, I’m drawn back to my pen and journal (to write devotionals) or the computer keyboard. I suppose it’s the same reply a musician might give if asked a similar question. He cannot stop making music like he cannot willfully stop his heart from beating. So it is with me and writing. My main character’s names are Amanda and Ezra. For him, I wanted a less-common, biblical name and for her, I wanted a name that brought a strong yet naïve young lady to mind—I don’t mean that in a negative way at all. Quite the opposite as you’ll see that Amanda in Love’s Guiding Light is quite a force to be reckoned with. I like to write early in the morning—sometimes before it’s even daylight. I don’t shower or get dressed, I write while wearing my jammies. I usually get a couple of hours in before getting ready for my day job. Unfortunately, I’m unable to write for a living. Being an author is hard work. Period. Why? Because authors aren’t paid by the hour for what they do. In fact, sometimes they are not paid at all. Before going Indie, I fretted over making back my advances from my publishers and worried about disappointing my editors. I think many times my fear got in the way of good writing. Now that I can impose my own deadlines and my company is publishing my stories, I feel freer because no one is investing in me—except me. I also have a very good critique partner and editor, both are distinguished in the publishing world. I don’t want readers to conclude that going Indie means my work gets published unchecked. It does not. There are still rewrites and revisions to deal with—and even then, having to pay my editor, a formatter, a cover creator, an author may not see a single monetary reward. And that’s just the beginning investment. Next comes the advertising. Yes, there is much to consider as an author. I like to say that typing “The End” on a manuscript really means it’s just the beginning. The best part of being an author is getting that email or handwritten letter from a reader who says my story changed her life somehow. The readers who contact me range in age from 12 to 94 and it makes my day when an email from a reader pops into my inbox. That’s the reason I write. I write for my readers. I write to show faith in Christ in action so readers’ faith might be strengthened somehow. I am most proud of my family. I have a husband of 40 years who still loves me; I have three grown sons who each has his Master’s Degree. I have a wonderful daughter-in-law and 5 precious grandchildren. They are my pride and joy. I enjoy family get-togethers which, now that the grandkids are getting older and busier the get-togethers are, unfortunately, few and far between. I also enjoy Civil War Re-enactments. I LOVE Christmastime. I love the baking, the shopping and buying gifts for others. It’s September as I write this, and I was just thinking this morning that I should wrap all the gifts I have already purchased so little eyes don’t spy them in my closet. They know where Grammy keeps them. I’m writing the third installation of my Shenandoah Valley Saga. This book is called There Is A Season. I anticipate the release date to be April 2019.